What is the source of the claimed dialogue? 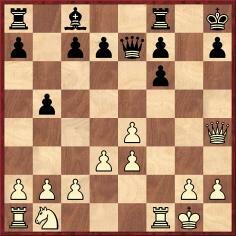 20 e5 Nd5 21 Rg3 Ne7 22 Ne4 Ng6 23 Ng5 Rfd8 24 Qh5 Nf8 25 Nxh7 Nxh7 26 Qh6 g6 27 Rh3 Qe8 28 Qxh7+ Kf8 29 Qh4 Resigns. 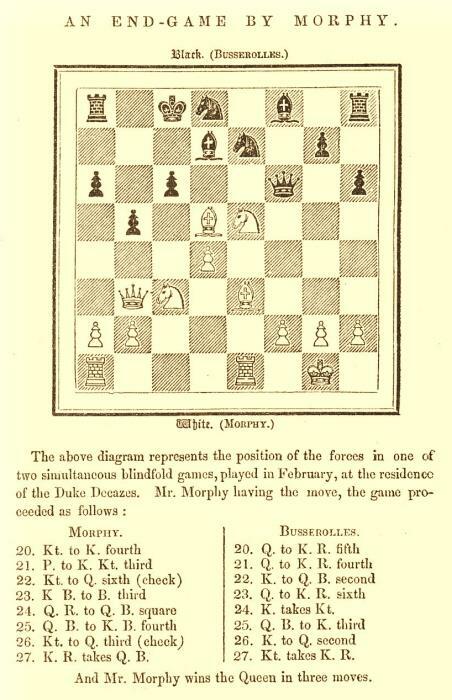 Page 228 of the Columbia Chess Chronicle, 29 December 1888 (article by G.H.D. Gossip). Page 45 of White King and Red Queen by D. Johnson (London, 2007). 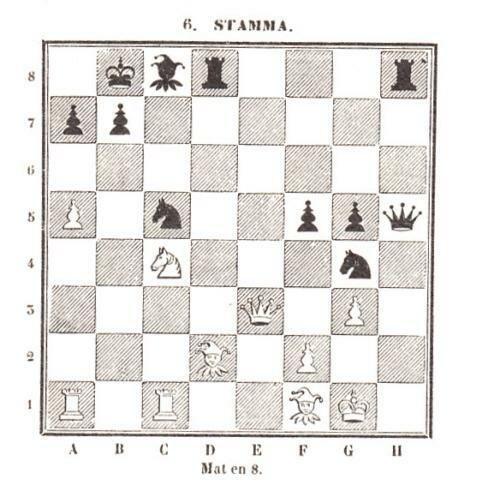 Page 113 of El campeonato mundial de ajedrez by E. Gufeld and E.M. Lazarev (Barcelona, 2003). 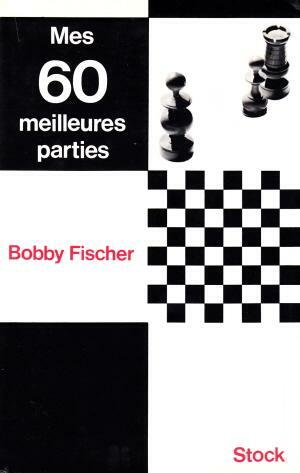 Page 65 of Bobby Fischer Goes to War by D. Edmonds and J. Eidinow (London, 2004). 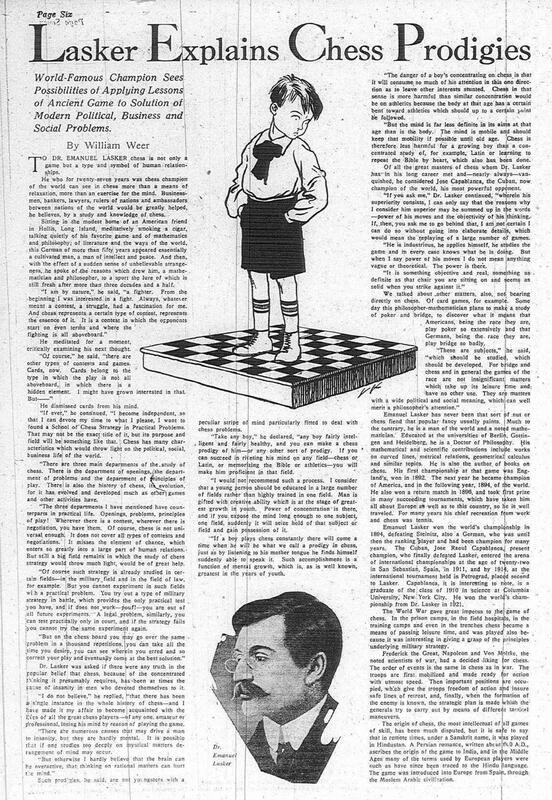 Page SM38 of the New York Times, 23 February 1958 (article by H.C. Schonberg – see C.N. 5491). 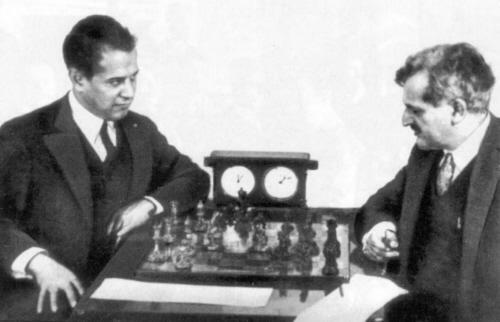 Schonberg referred to Capablanca as ‘the Mozart of chess’ on page 181 of Grandmasters of Chess (Philadelphia and New York, 1973). 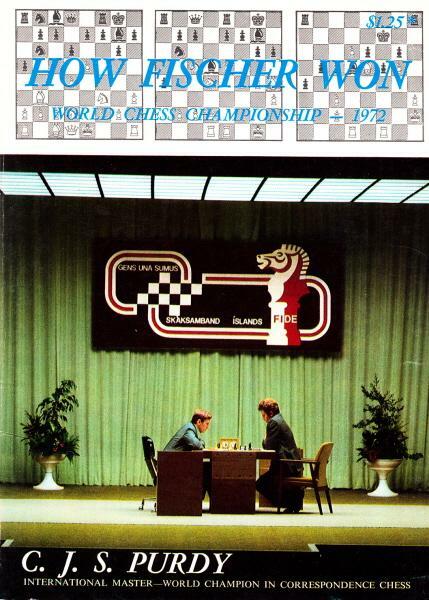 Page 21 of Karpov-Korchnoi 1978 by R. Keene (London, 1978). Lubomir Kavalek, article dated 23 February 2012. Philippe Kesmaecker (Maintenon, France) has found the above document at the Danish Politietsregisterblade website. 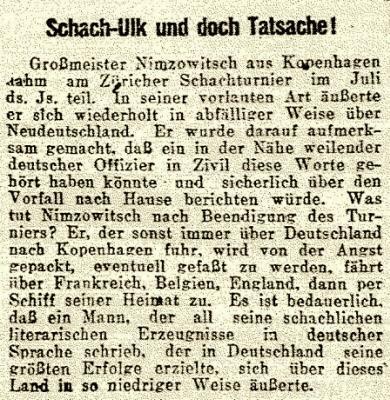 Full name: Aron Nimzowitsch. Occupation: chess master. 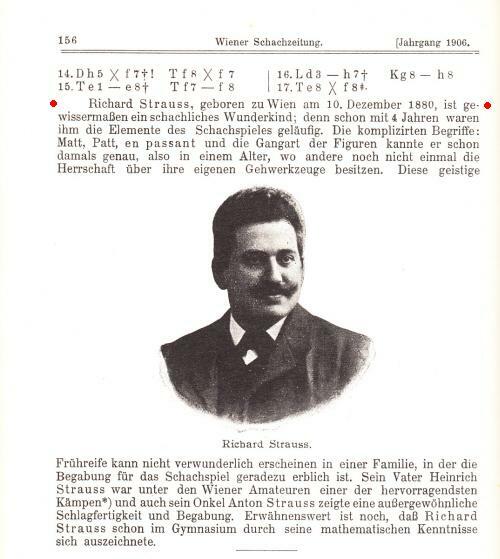 Born in Riga on 7 November 1886. 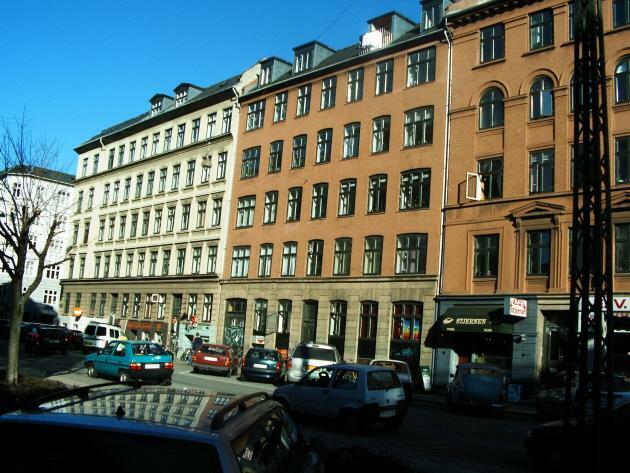 On 29 November 1922 he moved to Nansensgade 32, first floor, his landlord being named Nielsen. 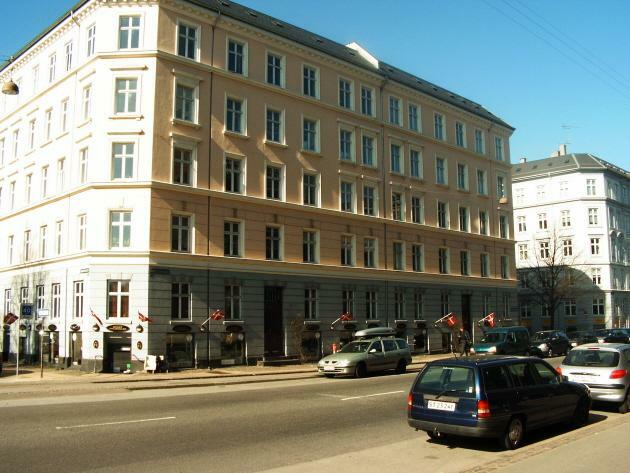 On 11 June 1923 he moved to the Missionshotellet (Missionary Hotel) at Løngangstræde 27. Øster Farimagsgade 11 is on the right, behind the pedestrian. A copy of better quality is sought. Rook endings a pawn up are generally drawn – but rook endings a pawn down are usually lost. The most attractive combinations are usually just one tempo short of being sound. 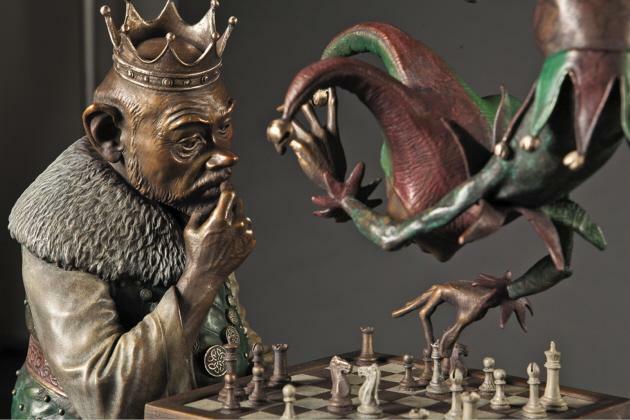 The popular press believes that chess congresses are composed exclusively of child prodigies and octogenarians. 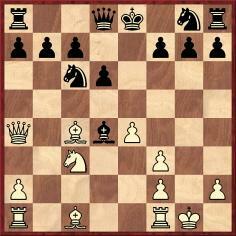 Players indicate an increasing maturity at the game by not automatically making the en passant capture. Players with the greatest theoretical opening knowledge are most likely to get into time-trouble. The weakest players in a tournament are generally first to enquire about the prizes. 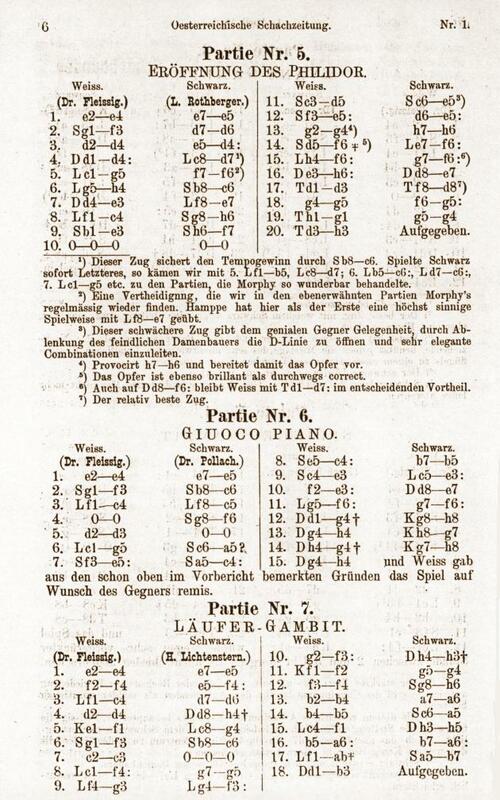 Annotations attempt to prove that a game had only one logical sequence. 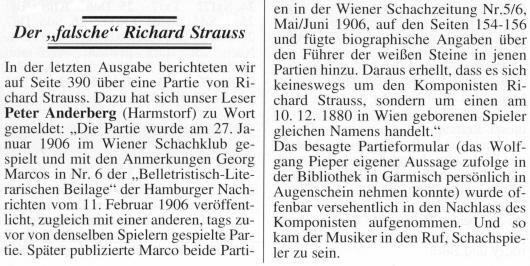 Is it really impossible to find anything about Lipschütz (and, in particular, his forename) in archives or other reference sources in Hamburg? The question raised in C.N. 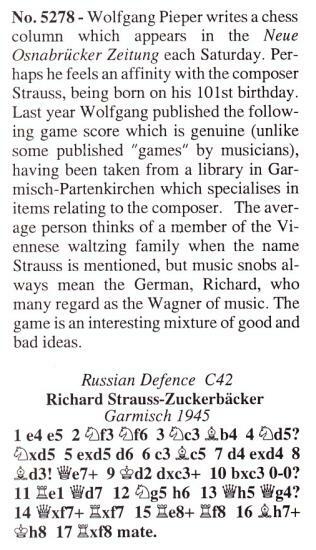 7639 was when Steinitz first played 1 d4. 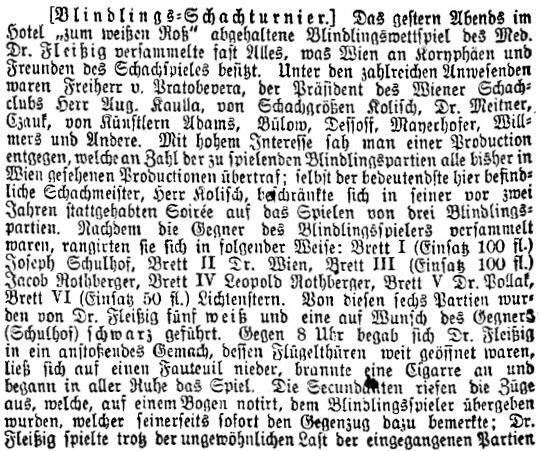 Our correspondent also points out Steinitz v Jeney, Vienna, 4 September 1860, which opened 1 c4 e6 2 Nc3 d5 3 e3 Nf6 4 Nf3 Nc6 5 d4. 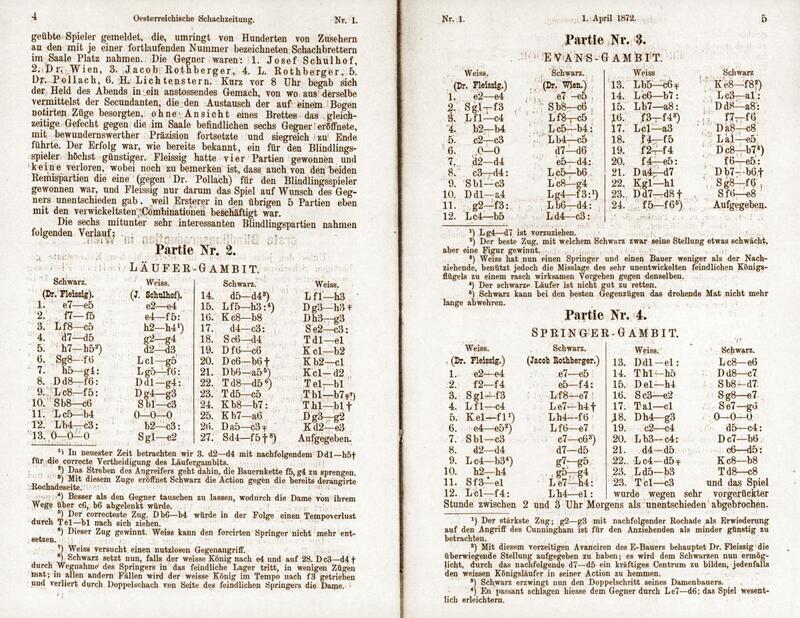 See, for instance, page 383 of volume one of Schachmeister Steinitz by L. Bachmann (Ansbach, 1925). 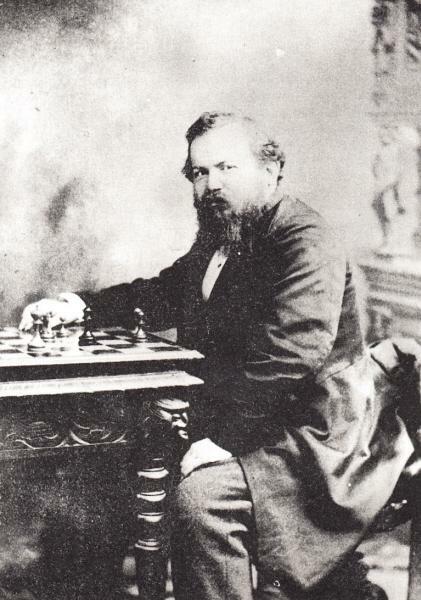 Finally, Mr Kensdale remarks, a game between Steinitz and Healey (London, 1864), played at king’s knight’s odds, began 1 d4 d5 2 c4 c6. It is on page 88 of the Bachmann book. ‘Relieving the suspense.’ ‘Gardant le suspense.’ (Game 60). C.N. 867 was published in 1984. 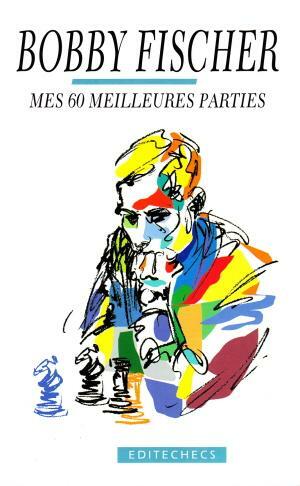 Just over a decade later Editions Editéchecs, Paris reissued Fischer’s book, without any attempt to correct the translation. Mike Salter (Sydney, Australia) notes that whereas a 16-move draw between Najdorf and Che Guevara at a simultaneous exhibition in Havana in 1962 has been given, an unsourced quote on page 44 of Najdorf: Life and Games by T. Lissowski and A. Mikhalchishin (London, 2005) has Najdorf claiming that he won on that occasion, after refusing a draw because he wanted revenge for a loss to Che Guevara in a display at Mar del Plata in 1947. How is the discrepancy to be explained? 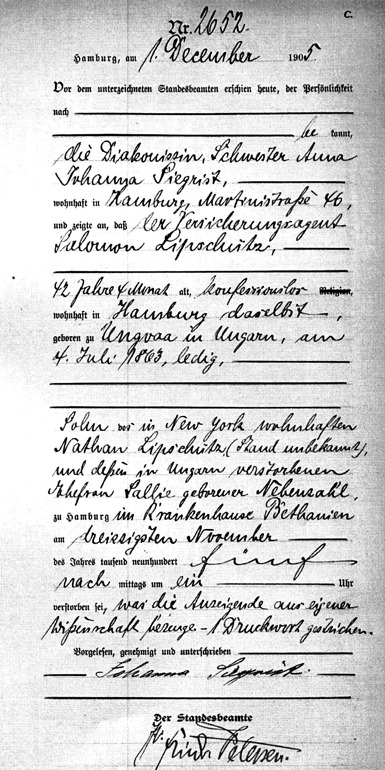 Before the undersigned registrar there appeared today, personally known, the deaconess, Sister Anna Johanna Siegrist, residing in Hamburg, at Martinistrasse 46, and reported that Salomon Lipschütz, insurance agent, 42 years and 4 months old, no religion, residing in Hamburg at the address mentioned, born in Ungvaa [sic] in Hungary, on 4 July 1863, unmarried, son of Nathan Lipschütz, residing in New York (profession unknown), and his wife Sallie Nebenzahl, deceased in Hungary, died in the Bethanien Hospital on 30 November in the year 1905 in the afternoon at one p.m, as she, the reporting person, reported from her own knowledge. C.N. 6081 gave a photograph of Clement Freud presenting a cheque to Robert Bellin, the winner of the London Chess Congress in Islington in December 1972. ‘To attempt to be rational about an event as sensationally irrational as the world chess championship of 1972 is no easy matter. The fact is that for five long days officials, players, observers and prospective cash customers have been so bemused by the human tantrums and quirks of fate surrounding the match – or, to be strictly accurate, non-match – that the basic truth escapes them: a brace of players are about to compete for a prestigious title and a lot of money. ‘Suddenly, at 8.46, they appeared on the stage, and to our amazement they were nice ordinary pleasant-looking soberly-dressed young men. We have seen no references to chess in Clement Freud’s autobiography Freud Ego (London, 2001). 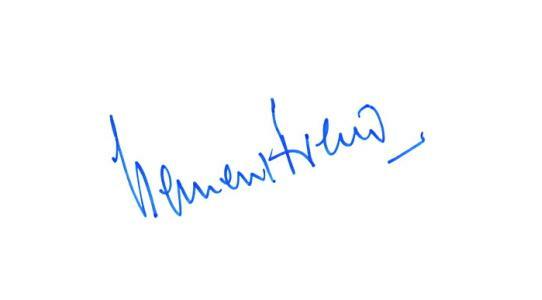 Clement Freud’s signature in our copy of Freud Ego. 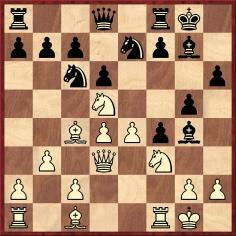 Steven B. Dowd (Birmingham, AL, USA) comments that there are two winning moves, 1 h3 and 1 Kc3. Since that was the last issue of the Monthly, no solution was published. 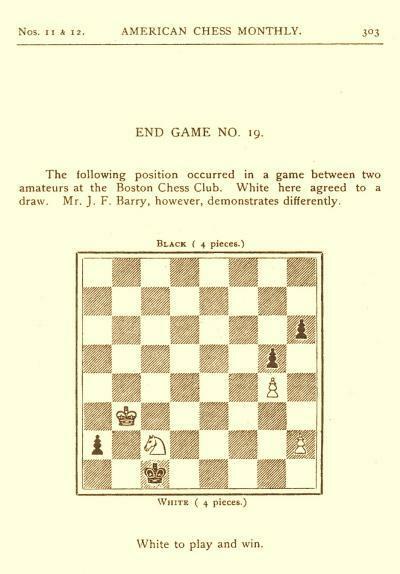 Harold van der Heijden’s Endgame study database III gives the position as a composition by ‘unknown’, from the American Chess Monthly of 1926. The solution appears as 1 h3 Kb1 2 Na1 Kxa1 3 Kc2, with the cook 1 Kc3 Kb1 2 Na1 Kxa1 3 Kc2. 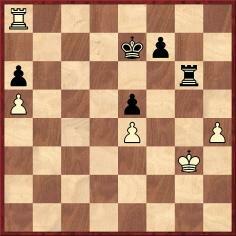 22 Rd4 Rb8 23 Rc4 Rxb2+ 24 Kxb2 Rb8+ 25 Ka3 Qg7 26 Qxc6+ Ke6 27 Nf4+ Resigns. 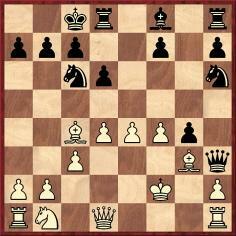 12 Bb5 Bxc3 13 Bxc6+ Kf8 14 Bxb7 Bxa1 15 Bxa8 Qxa8 16 f4 f6 17 Ba3 Qc8 18 f5 Be5 19 f4 Qb7 20 fxe5 fxe5 21 Qd7 Qb6+ 22 Kh1 Nf6 23 Qd8+ Ne8 24 f6 Resigns. 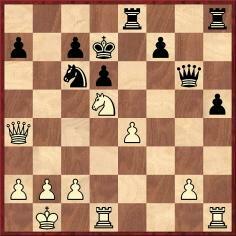 17 Rc1 Ng6 18 Qg3 O-O-O 19 c4 dxc4 20 Bxc4 Qb6 21 d5 cxd5 22 Bxd5+ Kb8 23 Bb3 Rc8 24 Rc3 Drawn. 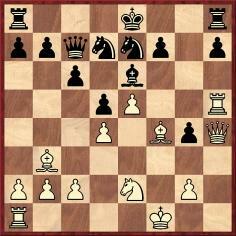 1 e4 e5 2 Nf3 Nc6 3 Bc4 Bc5 4 O-O Nf6 5 d3 O-O 6 Bg5 Na5 7 Nxe5 Nxc4 8 Nxc4 b5 9 Ne3 Bxe3 10 fxe3 Qe7 11 Bxf6 gxf6 12 Qg4+ Kh8 13 Qh4 Kg7 14 Qg4+ Kh8 15 Qh4 Drawn. 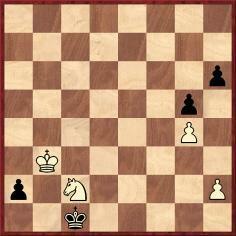 13 b4 a6 14 b5 Na5 15 Bf1 Qh5 16 bxa6 bxa6 17 Bxa6+ Nb7 18 Qb3 Resigns. 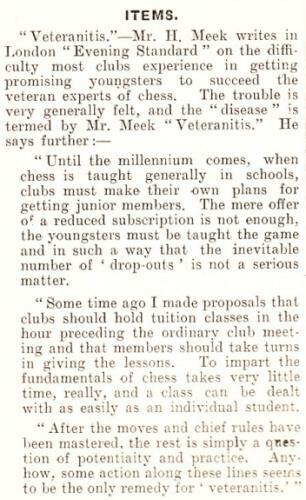 Source: Dubuque Chess Journal, September 1875, page 363. 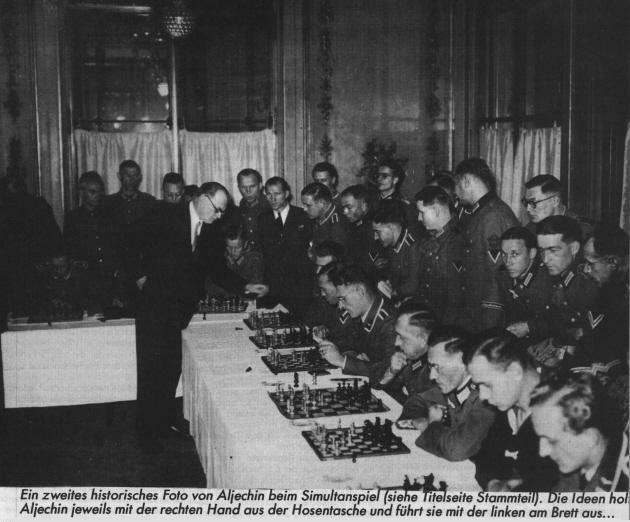 The magazine stated that the photograph was taken after Pachman had played 14...b5. 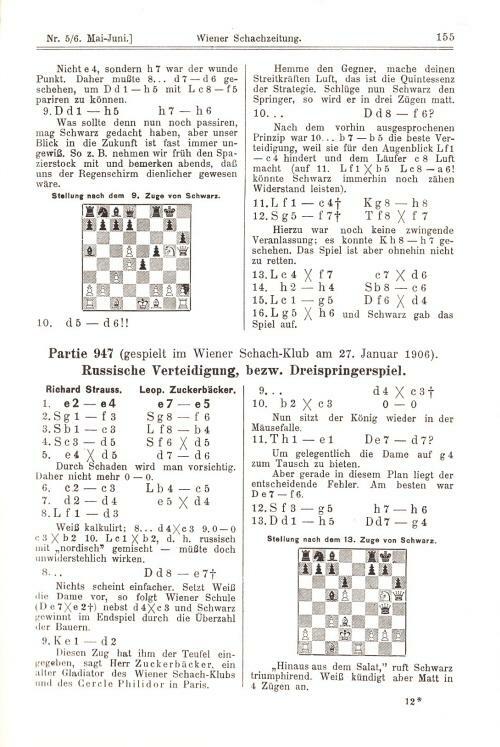 Eley won the game in 24 moves and annotated it on pages 266-268 of the June 1973 BCM. 20 Rxb6 cxb6 21 f5 Ne7 22 h3 Rhc8 23 Nb5 Rc2 24 Nxd6+ Kg8 25 Bf4 Be2 26 Re1 Ba6 27 Nf3 Nc6 28 g4 Nb4 29 Rc1 Rxc1+ 30 Bxc1 Rd8 31 Bf4 Nd3 32 Bg3 Nb2 33 e5 Nc4 34 Ne4 fxe5 35 dxe5 b5 36 e6 bxa4 37 f6 gxf6 38 Nxf6+ Kg7 39 e7 Rd1+ 40 Kf2 Bb5 41 e8(Q) Bxe8 42 Nxe8+ Kf7 43 Nc7 a3 44 Ne5+ Nxe5 45 Bxe5 a2 46 Kf3 a1(Q) 47 Bxa1 Rxa1 48 Ke4 Rc1 49 Nb5 Rc6 50 g5 a4 51 h4 Kg6 52 White resigns. 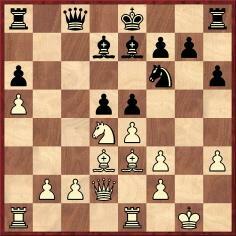 27 Bxc5 Nf2+ 28 Qxf2 Bxf2 29 Nxb7+ Ke8 30 Rf8+ Rxf8 31 Rd8+ Kf7 32 Rxf8 mate. 39 Kh3 Rc6 40 h5 Rf6 41 Kh4 Rf4+ 42 Kg5 Rf6 43 h6 Resigns. 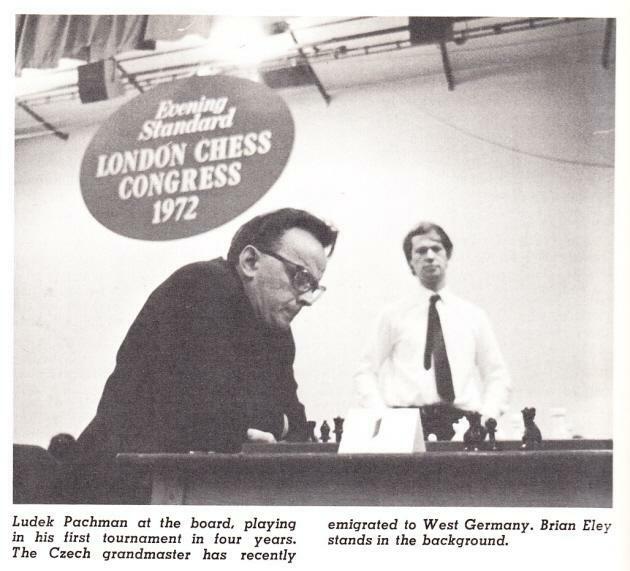 ‘Pachman played at the Evening Standard tournament in Islington, London in 1972 on my initiative. 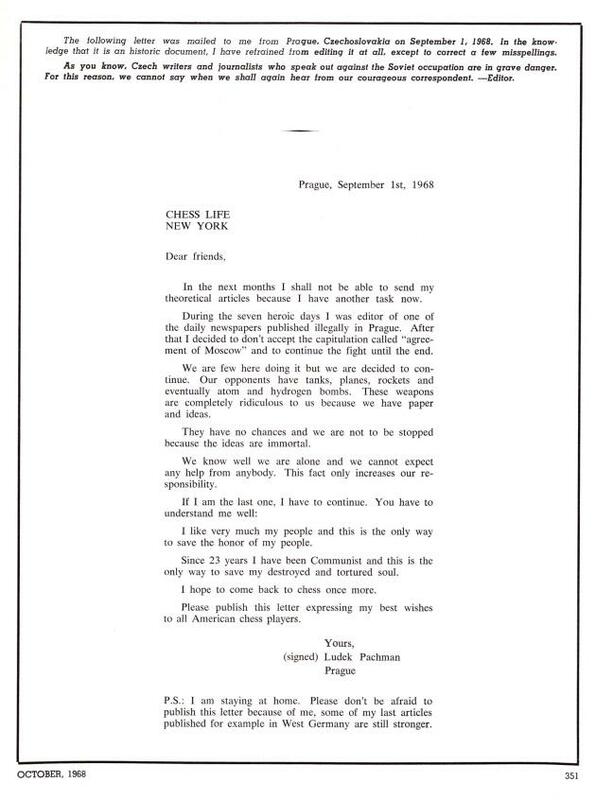 The Standard naturally wanted a personality to channel publicity for the Open, and news of Pachman’s release from prison and emigration to West Germany came a few weeks before the tournament. I had got on well with him when we met at Olympiads and, even earlier, at Southsea, 1949, and I also knew Wolfgang Unzicker, at whose home in Munich he stayed after his release. The Standard was willing to pay for his trip to London, so he agreed to compete. While in prison Pachman had sent an emotional rallying call to chessplayers which was published on page 351 of the October 1968 Chess Life. At the end of the opening ceremony at London, 1972 I read out this message to the players, after which Pachman entered the hall and walked, applauded, to the stage. As I recollect, many of my audience looked fidgety, obviously not very interested and evidently keen for the first round to start. We wanted him to have an interesting first-round opponent, so Stewart Reuben adjusted the draw slightly so that Pachman was paired with Jonathan Speelman, then aged 16. Pachman won. Of course, he was not technically or psychologically prepared for a weekend tournament with three rounds on the Saturday, so it was no great surprise that the next day Brian Eley caught him in the “DERLD”, which was then a much analysed opening in England. I was at that time the chess adviser to Faber and Faber, whose director, Charles Monteith, had a celebrated record for spotting and publishing winners – which had included Waiting for Godot and Look Back in Anger. Faber and Faber had a mutual arrangement with Simon & Schuster and was offered the British rights (for a low figure) to Fischer’s My 60 Memorable Games, which Monteith took up on my enthusiastic recommendation. So when I knew Pachman was coming and that he had announced that he was preparing his memoirs, I told Monteith. Another publisher was also in the hunt. When Pachman arrived at Heathrow Airport there were flowers to greet him from the rival publisher, but Monteith was there with a contract ready for signature. “Flowers good, contract better”, said Pachman. The memoirs, Checkmate in Prague, were published by Faber and Faber in 1975 but, alas, were written in a rather turgid style and were a marketing flop. Clement Freud was invited to award the prizes at the 1972 Evening Standard congress because Stewart Reuben had read Freud’s articles on the Spassky v Fischer match; he was suitable as the high-profile personality we wanted to justify the Standard’s backing. 7670. 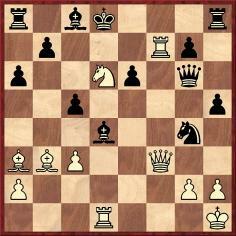 Mate-in-three problem by Alekhine? The key move was given on page 443 of the 10 August 1955 issue, but without further particulars about the source of the composition. 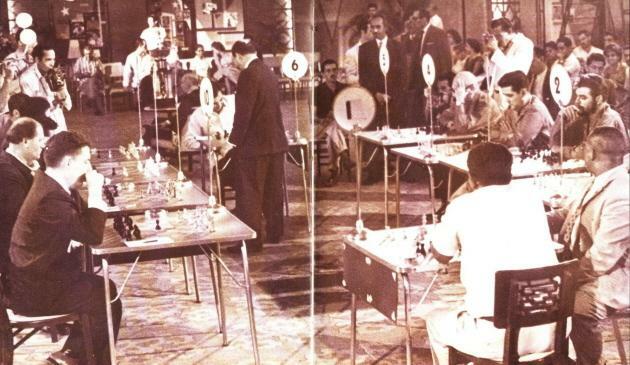 ‘Luego de ganar el torneo en memoria de Capablanca, el Che me invitó a jugar diez simultáneas a ciegas contra el equipo ministerial. Acepté. Él ocupó el tablero número tres. Participaron Raúl Castro, hermano de Fidel, el capitán Osmani Cienfuegos, sobrino de Camilo, el comandante Alberto Bayo y otros. El Che era un jugador bastante fuerte. Prefería el juego agresivo y dado a los sacrificios, pero bien preparados. Con él llegué a estar un poco mejor y le ofrecí tablas. Las rechazó. – Mire, maestro – me dijo – siendo estudiante de medicina perdí contra usted en una exhibición que dio contra quince tableros en el hotel Provincial de Mar del Plata y ahora prefiero la derrota o buscar el desquite. 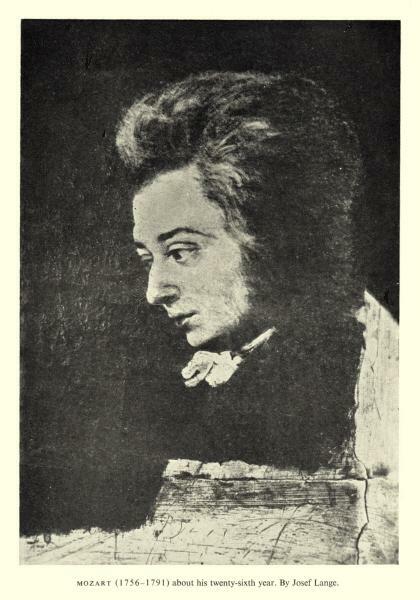 Thus, compared to the version quoted in C.N. 7656 the roles of Najdorf and Che Guevara are reversed. 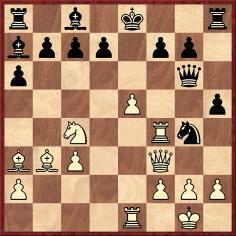 This time, Najdorf says that he made a draw offer and that Che Guevara rejected it. See too Najdorf’s words quoted in a ChessBase article (which, incidentally, mis-dates ‘The Polish Immortal’). Moreover, the ChessBase article also refers to the Najdorf v Che Guevara game in the context of a blindfold display, which prompts Mr Sánchez to wonder whether there was more than one exhibition in Havana involving the two players. Mark Josephson (Highland Park, IL, USA) is seeking information on ‘how Mikhail Tal and his family avoided the Nazis, as they were Jews from Riga’. Wanted: accounts giving more details. C.N. 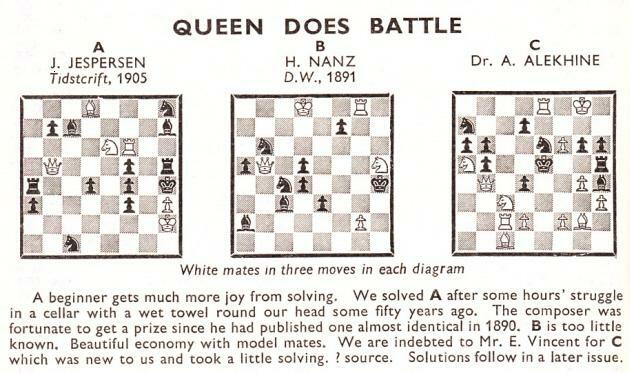 642 suggested ‘an interesting game in all its phases’ as ‘the Crown Prince of chess clichés’. For the title of King, ‘the rest is a matter of technique’ is doubtless a front-runner. Wanted: other nominations. 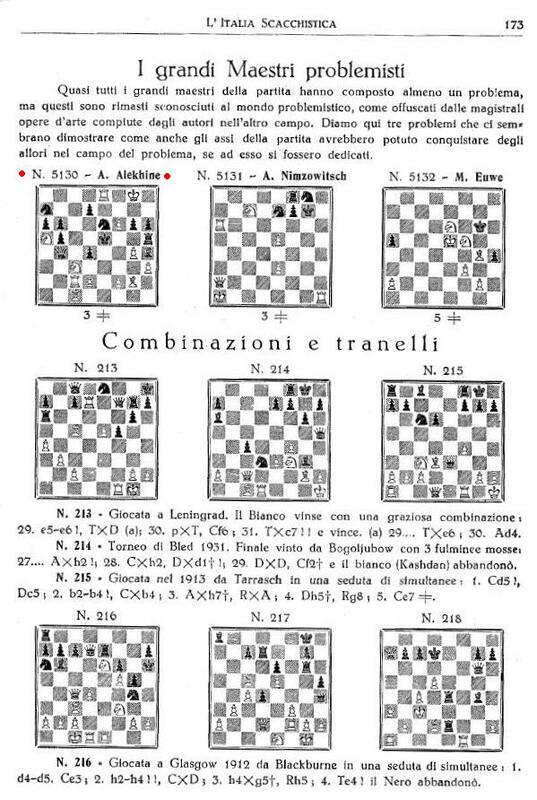 On page 34 of The Encyclopedia of Chess (1977), Golombek called [1 d4 Nf6 2 c4 e6 3 Nf3 Bb4+] the ‘Bogoljubow Defence’, observing: ‘Otherwise known under the hideous name of Bogo-Indian Defence, this defence often transposes to other openings (Nimzo-Indian, Queen’s Indian, Catalan, etc. ).’ W.H. Cozens observed on page 401 of the September 1978 BCM that Golombek ‘describes the word Bogo-Indian as hideous, while allowing the exactly analogous Nimzo-Indian to pass without stricture’, and the paperback edition of the Encyclopedia (1981) dropped the ‘hideous’ criticism. 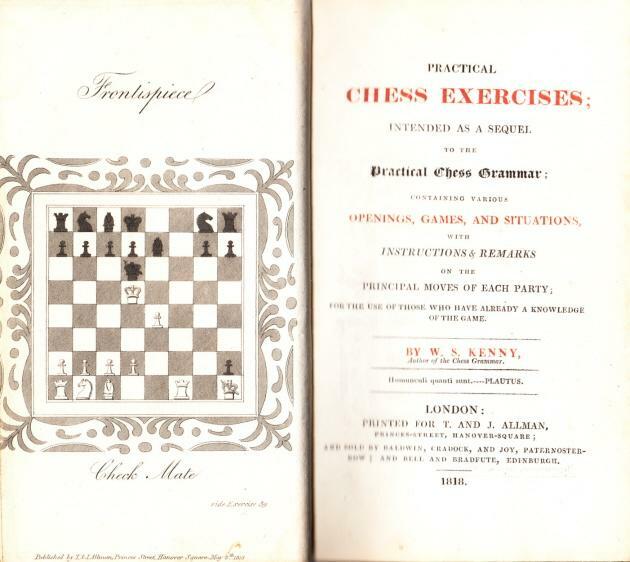 ‘Where chessplaying is most active and where in consequence opening theory is most rife, there nationalistic feelings rage and madden round the land. The Russians and the Germans, the Dutch and the Yugoslavs, are all most active in this field. In most cases it would take a Solomon, or a Caucasian chalk-circle, to determine the true parent of an opening variation. I myself have suffered at the hands, or rather the claws, of these predators, having had no less than four lines filched from me in the course of some 40 years of international play. Nor am I the only sufferer. There is the Reynolds variation in the Semi-Slav that the Germans have called the Klaus Junge line and the Abrahams variation of the same opening known to the Dutch as the Noteboom line. 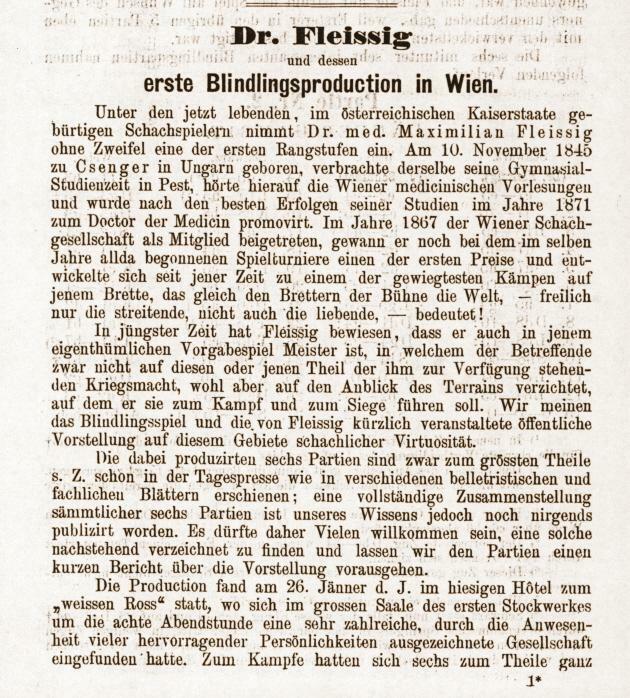 Source: Schweizerische Schachzeitung, August 1923, page 120. 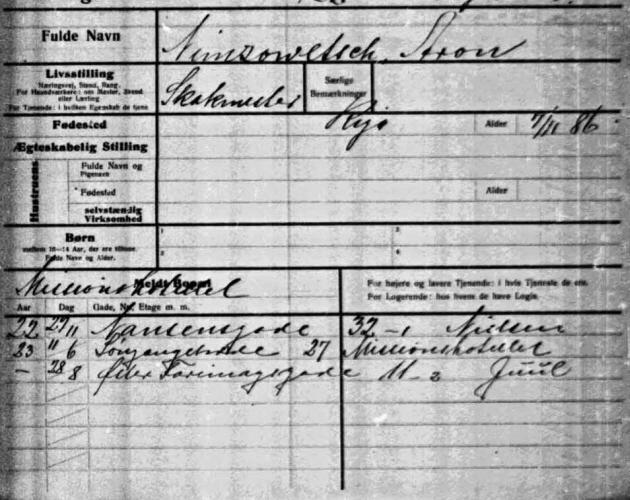 Gene Gnandt (Houston, TX, USA) asks whether the full name and birth/death dates of General Busserolles are available. 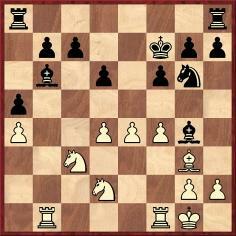 ‘The War has caused many losses among Soviet chessplayers. The talented young masters Sergei Belavenets, Joseph Rudakovsky and Lev Kaiyev have perished in battle for their country. Mark Stolberg, 18-year-old [sic] Rostov master, is missing in action. 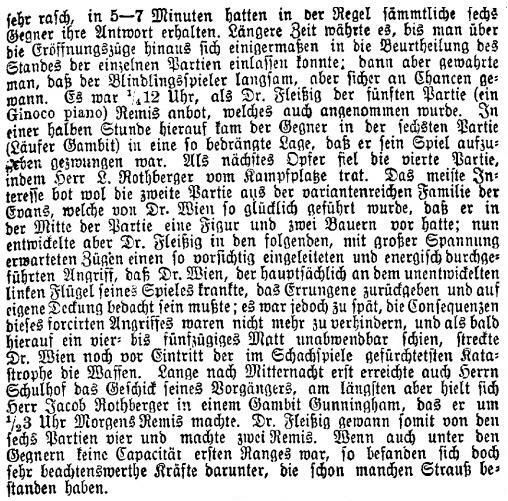 A German bomb killed Alexander Ilyin-Zhenevsky, one of the old Russian masters, who at a tournament in Moscow in 1935 [sic – 1925] won a sensational game from Capablanca, then world champion. 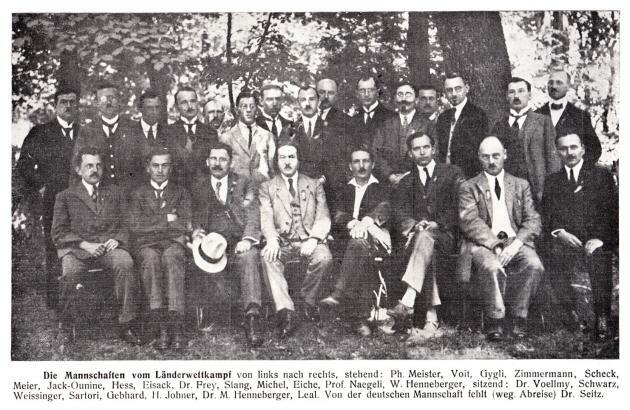 I was personally indebted to Ilyin-Zhenevsky for organizing my match with Grossmeister Salo Flohr in 1933. Ilyin-Zhenevsky was at that time working in the Soviet diplomatic mission in Prague. 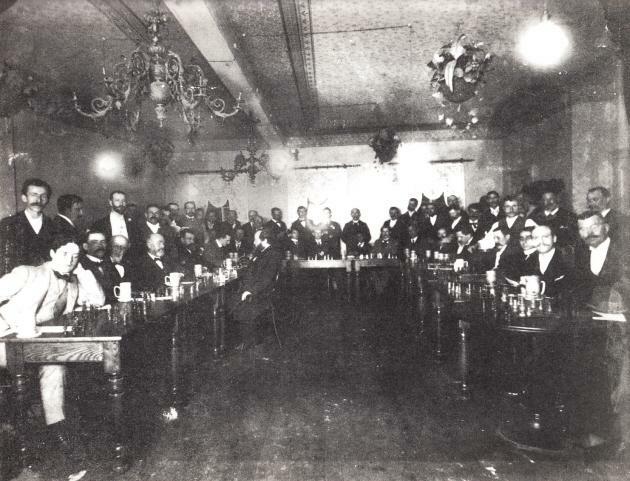 Also among the missing are the masters Ilya Rabinovich, participant in many international chess tournaments, and Nikolai Ryumin, whose name swept the entire chess world in 1935 when he won a victory over Capablanca in the first round of the Second Moscow International Tournament. Regarding Rudakovsky, Jeremy Gaige’s Chess Personalia states that he died in 1947, in Chernovtsy. 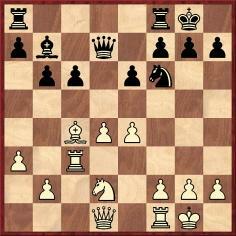 11 e5 Bxf3 12 Nf6+ Bxf6 13 exf6 Bh5 14 Bxf4 Bg6 15 Qh3 Nf5 16 Bxg5 hxg5 17 Rxf5 Nxd4 18 Qh6 Nxf5 19 Qxg6+ Kh8 20 Qh5+ Kg8 21 Qxg5+ Kh8 22 Qxf5 and wins. 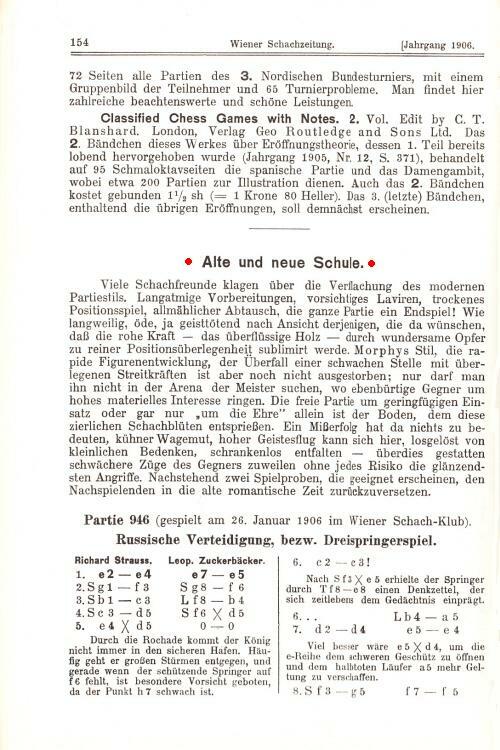 It was merely stated that the game was ‘recently won by a Lady’ and that Black was Löwenthal (the magazine’s Editor). 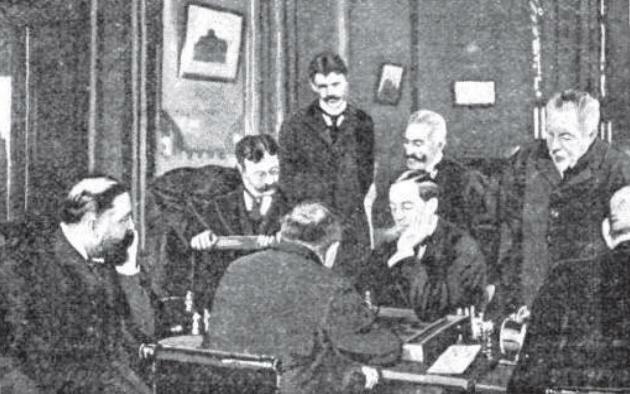 Mr Bertola asks whether White’s identity is known and whether any earlier game-scores exist in which a prominent player was defeated by a woman. That, of course, is hardly the end of the story. How much further back can the problem be traced?